Michael Dorsch, Sales Director and Civil Engineer, recently presented Maccaferri’s research at the Mid-Atlantic International Erosion Control Association’s Annual Conference in Richmond, Virginia. The use of gabions and Reno Mattresses in shoreline and stream restoration is widespread practice for many US government agencies and private owners. However, the growing concern about climate change and its negative effects on the environment and on global economies is forcing leading organizations around the world to identify solutions which prove to have minimal impact in terms of greenhouse gas emissions (GHG) and high absorption of CO2. Maccaferri carried out a study to evaluate the carbon footprint of gabion and Reno Mattress structures compared to traditional construction techniques. 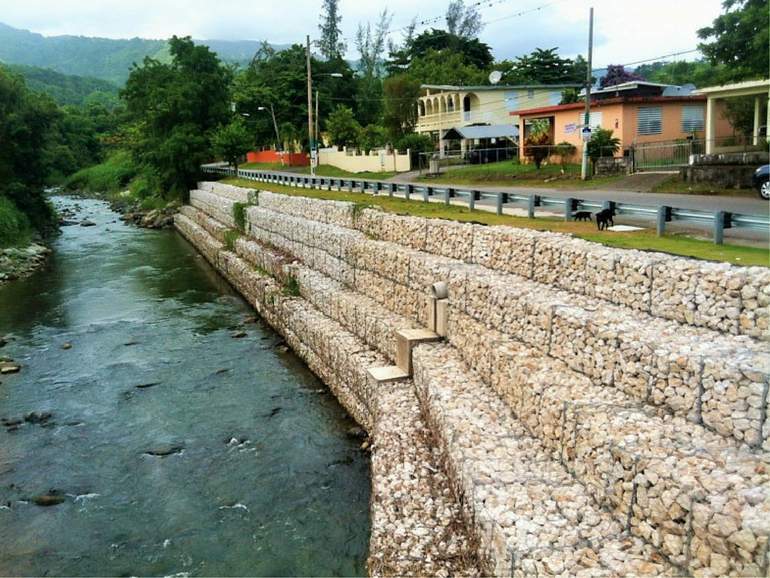 The study compared a gabion gravity retaining wall with a traditional concrete gravity retaining wall and a Reno Mattress river bank protection versus a traditional riprap with equivalent performance. Our team of researchers used the recently released “GHG Protocol Product Life Cycle Accounting and Reporting Standard”, by World Resources Institute (WRI) and the World Business Council for Sustainable Development (WBCSD) to calculate the carbon footprint of each structure. Additionally, 15 stream restoration projects using vegetated gabion solutions were analyzed to evaluate the absorption of CO2 by the shrub vegetation planted in the soil bio-engineered structures. Results of the study support the low-impact and sustainability of utilizing gabions and Reno Mattresses over traditional concrete construction methods. Read the full results of the carbon sequestration and carbon footprint study of double-twisted products, available prior to registration.